The Société de Conservation, d'Interprétation et de Recherche de Berthier et ses Îles (SCIRBI) has set up nearly 10 km of paths on Île de la Commune and Île du Milieu near Berthierville. These paths are open year-round. Interpretive panels placed along the route provide information to help visitors discover the flora and fauna of this wetland ecosystem. 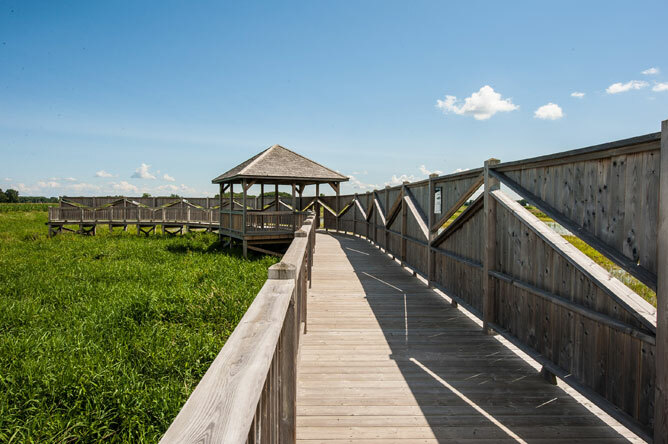 Three observation towers offer impressive views of the wide expanses of marshland. A section of the path runs by a community pasture, where hikers can approach grazing cattle and horses. Your browser does not support the software required to run the interactive 3D module. To access the module, please download the most recent version of one of the following browsers: Explorer, Safari, Firefox, Opera ou Chrome. To fully understand the rich biodiversity of wetland habitats, there's nothing like getting into the rhythm of the water's movements. Visitors can relax on a bench set up on a dock floating in an aquatic garden, and feel time drift away. In this peaceful atmosphere, the only sounds to be heard are the wind blowing through the leaves, dragonflies buzzing by, and the songs of the myriad frogs and birds. 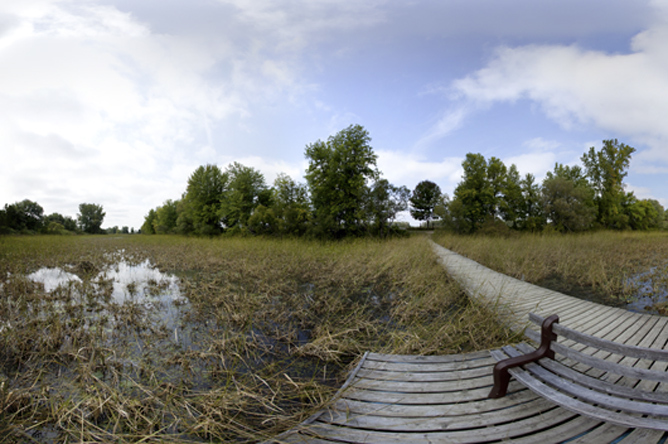 This birdwatching blind is located on the floodplain north of the St. Lawrence between Saint-Barthélémy and Maskinongé, which is a major stopover point for migrating ducks and geese. In the springtime, this is a popular destination for birdwatchers.